This is downtown Minden in 1921. The view is looking west on Esmeralda Street (or northwest, actually, since Minden is built on a diagonal). 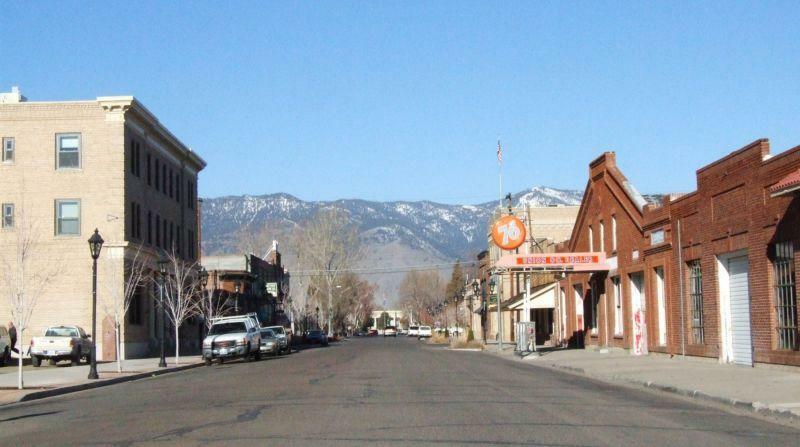 Minden was created in 1906 as the southern terminus of the Virginia and Truckee Railroad. The Railroad had originally wanted to build a line all the way through to Gardnerville, but the Dangberg Land and Livestock Company owned all the land that the tracks would have had to pass over. After a few back-door negotiations (and some speculated strong-arming by the Company), the V&T announced that it would instead build its depot in the middle of a Dangberg-owned cow pasture a couple of miles outside of Gardnerville. By the time the tracks were laid, the Dangbergs had built an entire town, seemingly out of thin air, right next to the depot site. H.F. Dangberg, Jr., named it after his father’s birthplace in Germany, and the Town of Minden was born. In this photo, we see downtown Minden as it appeared only fifteen years after the town’s founding. Already it was a bustling place, with plenty of business brought in because of the railroad. On the left side of the street is the Crystal Bazaar ice cream parlor, with the hulking Minden Inn behind it. Further back on the left is the Post Office, in the building which had originally housed the town bank, and behind that the “Carson Valley Improvement Club”, or C.V.I.C. Hall. On the far right of the picture sits the C.O.D. Garage, opened in 1912 by Clarence Oliver Dangberg (“C.O.D.”). This part of the building, the parts that faces Esmeralda, was an expansion that was built around 1918. Next door is the 1910 Minden Dry Goods Company, the local general store. Looming large behind that is the Farmer’s Bank of Carson Valley. This was the new bank building, built to replace the older, smaller structure across the street. At the far end of the road you can see the Douglas County Courthouse. In 1915 the county government was still situated in Genoa, by the Sierra foothills, but the Minden-Gardnerville area had become the true center of population and power in the valley. So the county seat was moved to Minden, and this new courthouse was built. It was open by the first week of January, 1916. Today downtown Minden is remarkably similar, at least on the surface. The Minden Inn, C.V.I.C. Hall, Farmers Bank, and C.O.D. Garage all still stand, mostly untouched from their 1920s appearance. And the Courthouse is still visible at the far end of Esmeralda Street, even though the trees are considerably bigger now. There’s only one noticable omission: the Crystal Bazaar was torn down some time ago. What’s different is what’s in the buildings. The Minden Inn hasn’t been used as a hotel for nearly twenty years. It spent part of that time vacant and mothballed, but since 1993 Douglas County has used the building as office space. The old bank/post office behind it is now an ice cream parlor, named The Bank. The second bank building, across the street, is used for lawyer’s offices now. And the C.O.D. Garage remained in operation for over 90 years, finally closing down in 2005. During those decades they built another addition to the east, and bought the Minden Dry Good Company next door, turning it into an auto parts store. The whole complex now sits empty, looking for new tenants to move in.